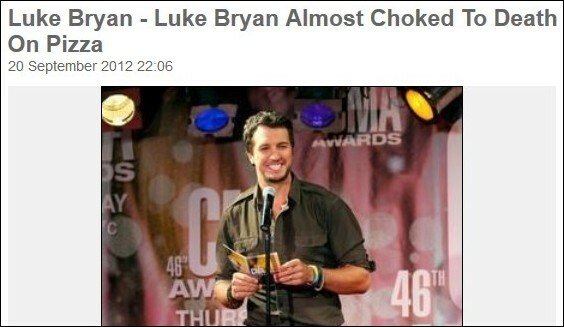 Choking rescues involving celebrities are a press agent's dream come true. For example, last May at a Pittsburgh restaurant, Cincinnati Reds third baseman Todd Frazier reportedly performed the Heimlich maneuver on a fellow diner who was choking, helping to remove a piece of steak caught in the man's throat. Scores of glowing media reports resulted from the episode. 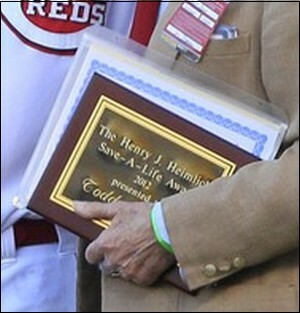 My father even got into the act to present Frazier with a Heimlich Institute "Save-A-Life" award. We’d hate to lose one of country music’s hottest artists! Luke is nominated for CMA’s Male Vocalist and Album of the year! Needless to say, I'm delighted Mr. Bryan survived what sounds like a terrifying, life-threatening incident. But how about some praise for the unnamed buddy who Heimlich-ed him? Over the past week I've made best efforts to obtain the friend's name and other details from Byran's press agent and his personal managers. 2) What's the name and location of the pizza restaurant? 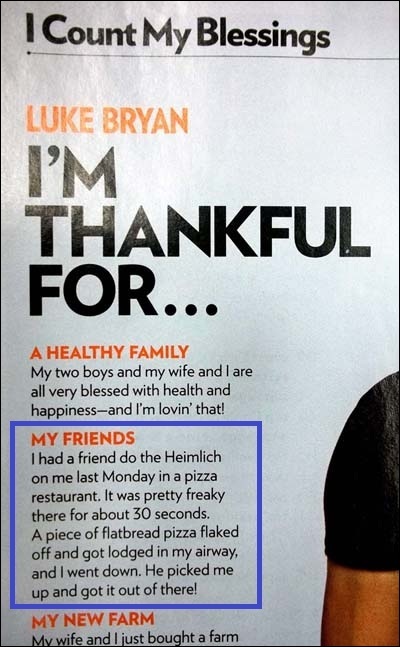 3) What's the name of Mr. Bryan's friend who performed the Heimlich maneuver on him? 4) Based on his description ("I went down"), it appears that Mr. Bryan may have lost consciousness. Is that accurate? 5) Did Mr. Bryan subsequently seek medical care? 6) What's the name of the People Country reporter who interviewed Mr. Bryan? I assumed they'd be eager to provide the information. The son of the doctor famous for the medical treatment that may have saved their client's life wants to write it up? Where's the downside? Bryan's publicist Taryn Pray at EMI/Capitol Records declined to provide any information. 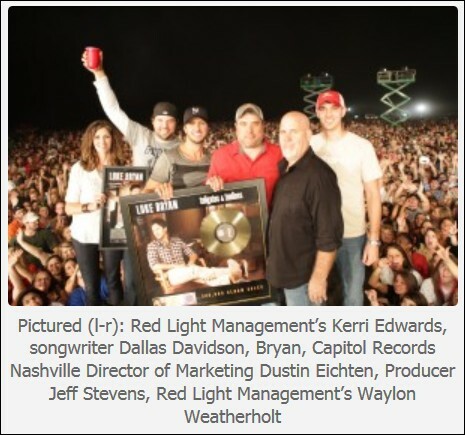 And his personal managers, Kerri Edwards and Waylon Weatherholt of Red Light Management, failed to respond to multiple inquiries. Since those turned out to be dead ends, I assumed People Country would be interested. They might even want to report an upbeat follow-up with an all-smiles photo of Bryan and his heroic friend showing how he performed the Heimlich maneuver on the singer. I've really got to get over this habit of assuming. 1. 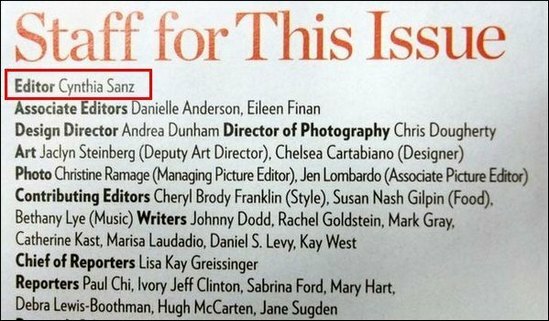 The interview with Mr. Bryan didn't include a byline. What's the name of your reporter who obtained the quote? 2. What was the date of the interview? 3. Does People Country intend to fact-check the information? If so, would you please courtesy-copy me? 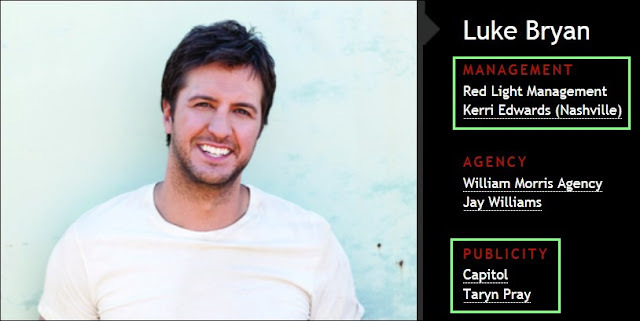 It's unclear why Ms. Sanz and the singer's representatives don't seem interested in giving Luke Bryan's rescuer friend the recognition he deserves, but perhaps others will. This item was updated with the September 24, 2012 tweet to Mr. Bryan.